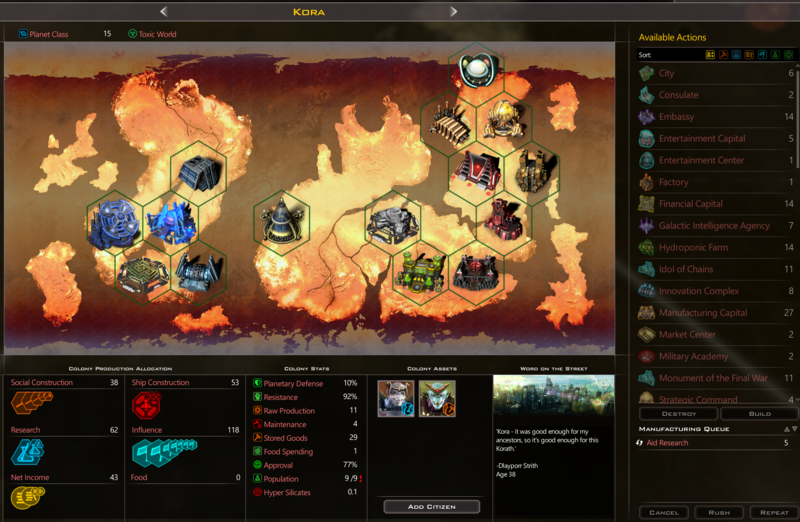 The Korath make no bones about what they're about: Extermination. They were bred by the Drengin to be the elite shock troops of the empire. Consider that -- the merciless Drengin Empire felt the need to breed a sub-species of Drengin who are even more brutal than they are. Let's take a look at the Korath. 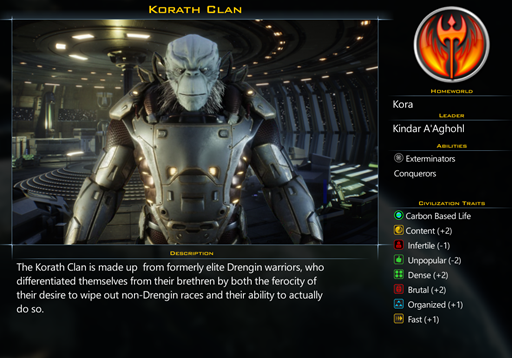 The Korath are the only canon species in Galactic Civilizations to have the extermination trait. This trait gives them access to a special technology called Spore Weapons. While other civilizations have to raise legions of troops to conquer a planet, the Korath will simply sterilize a planet from orbit - it doesn't matter how many legions are on the surface. This makes them extremely dangerous. To breed super-Drengin, the Korath are raised on a miserable planet surrounding a dying blue star. While the planet itself is productive (class 12), it is a hellish environment. The Korath are built for war. Unlike everyone else, they can exterminate planets using their spore ships, which bypass any legions on a given planet. The Korath start isn't that much different than other species, except there is one major difference: the Temple of Despair. 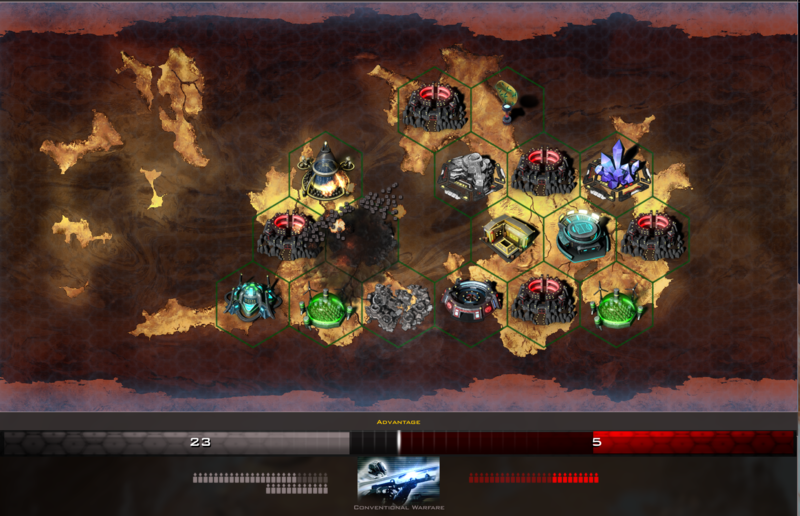 This improvement vastly increases the player's sensor range on their home planet and greatly expands their influence. It will lead to many beings wanting to visit the world it is on in order to indulge their darker impulses. It also gives a +3 bonus to any manufacturing that is near it, and it provides a commander! So yeah, it's incredibly powerful. Before the Temple of Despair is constructed you can see the unexplored space just outside the solar system. After its construction, the player can see a vast area around their world. It also quickly expands their influence. 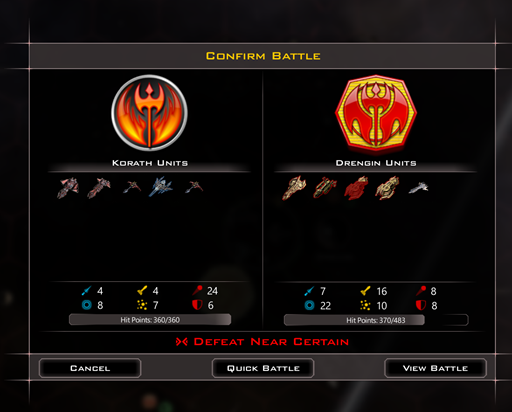 It is very, very difficult to play the Korath as anything other than malevolent. 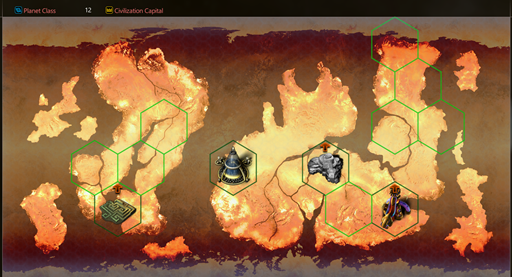 The Korath receive a series of unique and enticing monuments they can construct. However, constructing them produces a lot of Malevolent ideology points. Thus, if you want to get the most out of the Korath, it means you will likely be a pariah. They quickly see anyone around them. 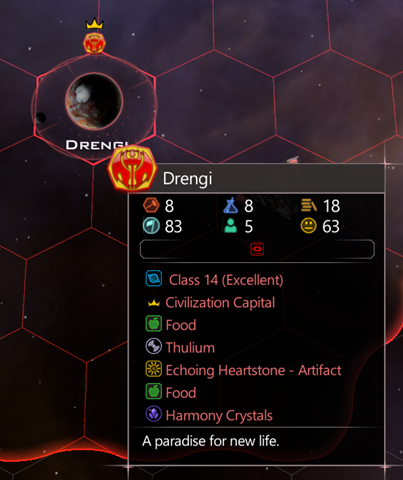 I can still get the early nice benevolent and pragmatic ideological bonuses from early game choices before I accept that I'm going to be a very, very evil civilization. I can generate a lot of income from tourism because of the Temple of Despair. I can exterminate planets relatively easily, meaning I don't have to worry much about legions. The Year is 2242. It is time for the Korath to cleanse this galaxy. 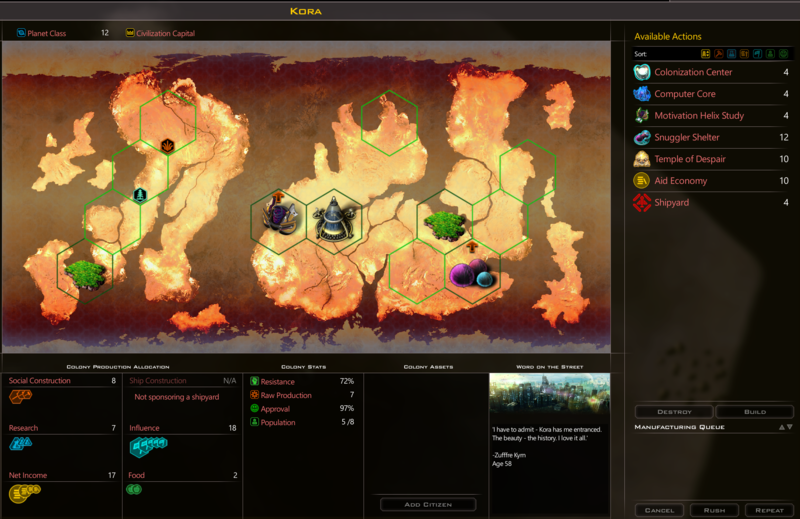 In this iteration, my home world of Kora has spawned with Hyper Silicates, which is a rare treat. It also has a Precursor artifact that gives the target planet a bunch of instant production as well as a Thulium deposit. So, we're off to a pretty good start. Send Survey Ship to nearby star. Set population of new colony ship to 1 (minimum -- to make sure Kora has a good population for more colony ships). Start building another colony ship. 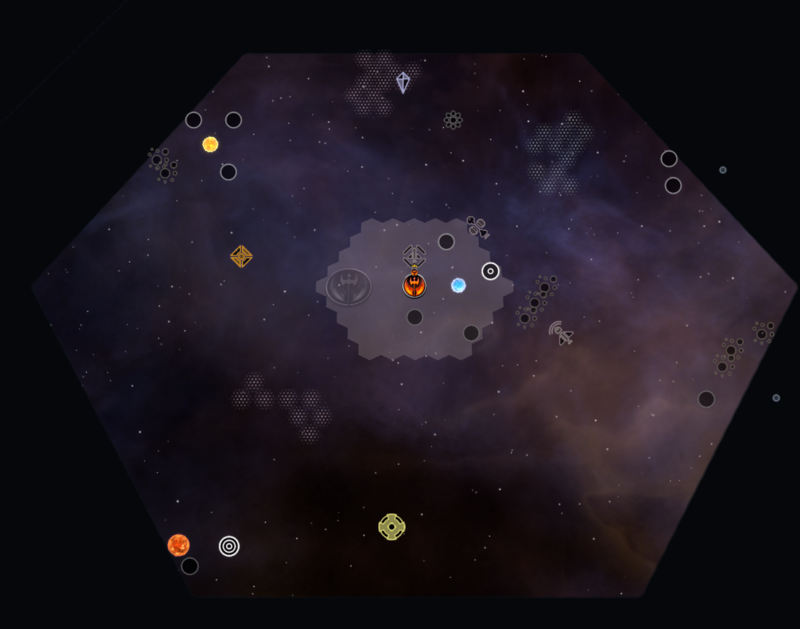 Send new colony ship to a different star than the survey ship. Rush Buy Temple of Despair. 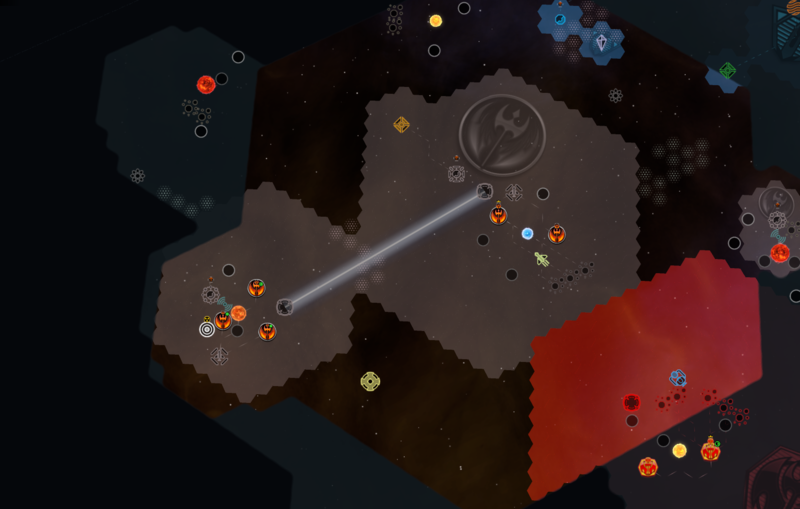 Temple of Despair quickly uncovers a bunch of stuff, including a class 12 planet in another solar system. 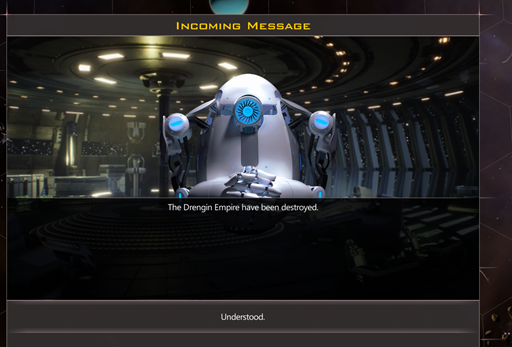 I encounter the Drengin, but I don't speak their language (the Korath have long lost that ability). Artificial Gravity has been researched. Archaic Languages chosen as next project so I can understand/trade with the Drengin. Computer Core has been completed. 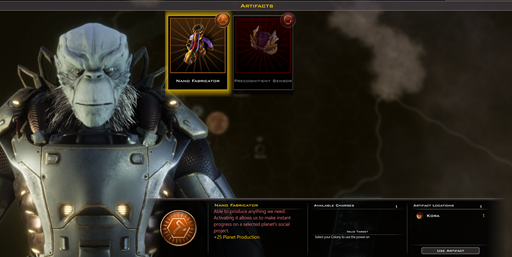 Nano Fabricator Artifact study chosen. 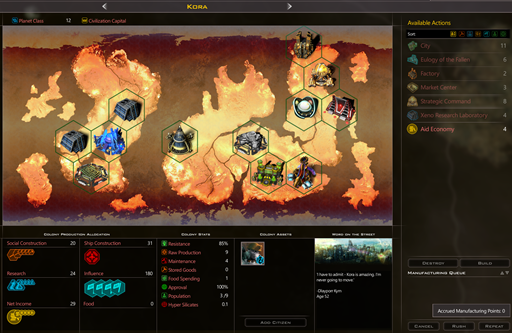 Korath is producing a crazy amount of influence. If you look closely, you will see 3 stored goods. When a project finishes now, overflow is saved for the next project. Survey Ship has found the Drengin home world. I compare the home worlds (I'm playing on Gifted). My population is a bit lower than theirs, but my research is better. Their planet started with food, which means they probably built the colonization center (which requires food), something I couldn't do. Survey ship sent to another solar system. New colony founded. I name it Ruin. Event: I make the pragmatic choice, which gives me a Kinetic Augmenter. Artifact that increases planet resistance on planet. Supply Depot is started. It will, however, take 19 turns. Planet only produces 3 social construction points per turn (compared to the 6 on Kora). Event: Ancient Device offers to terraform a nearby world. Yes. Yes! 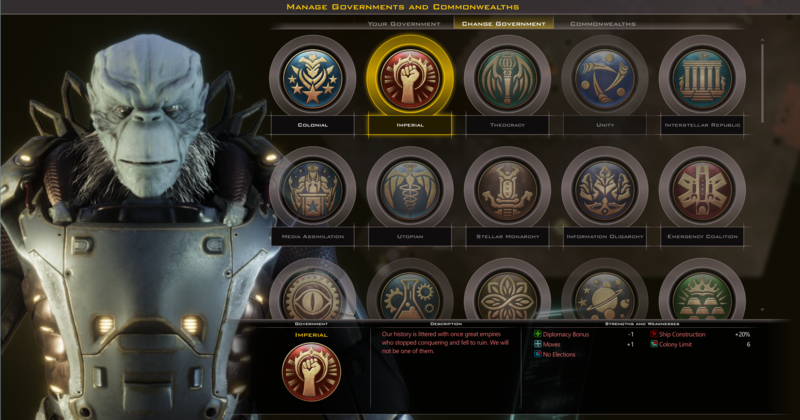 With a second planet, I'm asked to choose a form of government (Intrigue expansion feature). I choose Imperial. New planet is named Agony. Also unveils an amazing new planet nearby that I didn't previously know about. Ideology Pragmatism unlocked. I choose to get 3 free constructors. Kora now has access to food, so I choose to build the colonization center next to the temple of Despair because the Temple gives a +3 production bonus to it. On Agony, I choose to build a supply depot. Constructor 1 is sent claim a Thulium deposit in another solar system. 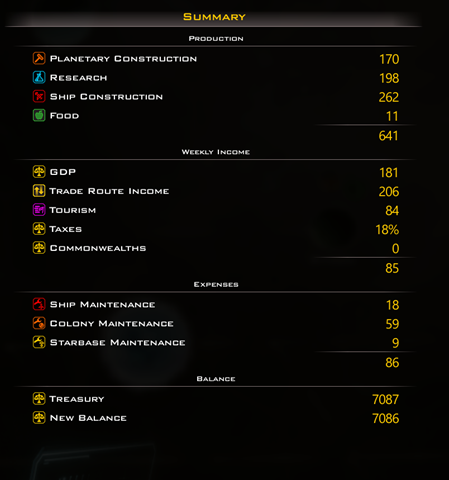 Constructor 2 is sent to claim a Precursor Economic relic, but is also within range of Kora, which means I can make it an Economy starbase that has an Archeology lab. 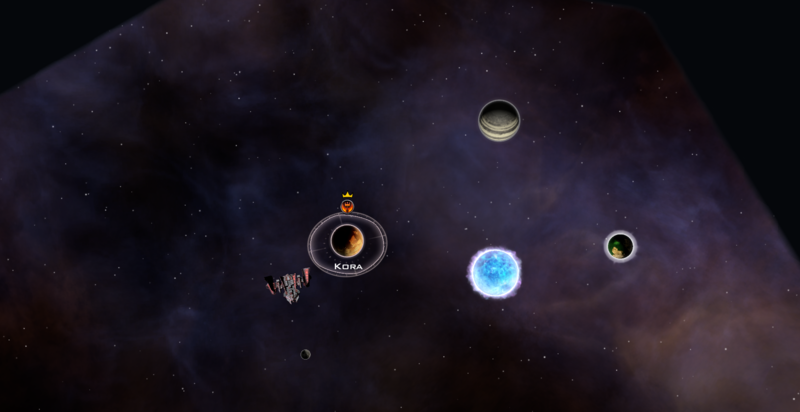 Constructor 3 is sent toward my awesome new solar system. The Korath will benefit from the Ship Construction bonus. New Constructor is sent towards my awesome solar system that has an unclaimed Precursor world. 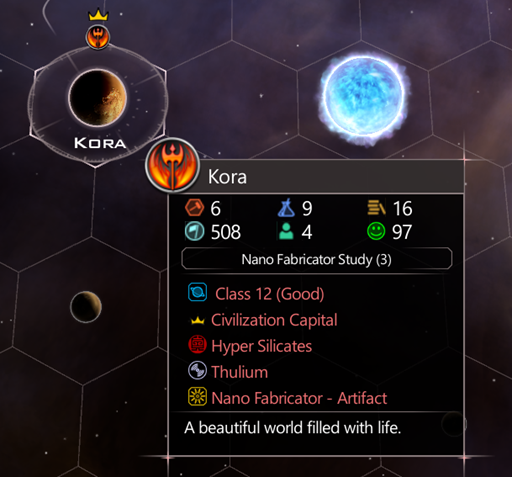 I set Kora's shipyard to have sponsors from all my planets ,despite that they are far away and much of the production is lost. Archaic languages is completed, so I choose Path to Purity, which will give me the Euology of the Fallen Wonder, something the Korath have unique access to. 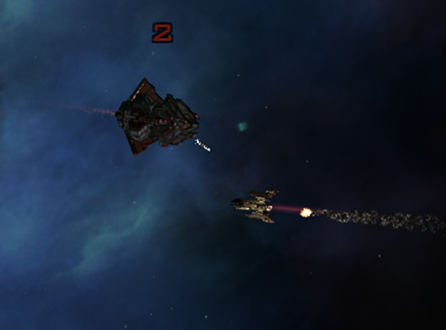 Survey ship is sent towards another star system. Colony ship selected as next project. New colony ship that just got completed is sent to claim that wonderful Precursor world. I open up negotiations with the Drengin now that I know their language. 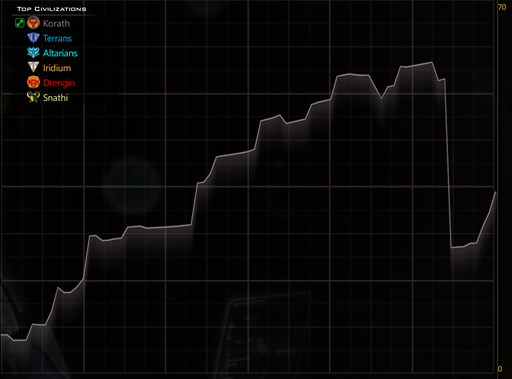 I trade them Artificial Gravity for money. I also trade them open borders to keep our relations decent...for now. With the money I build 3 asteroid bases near Kora to increase production. 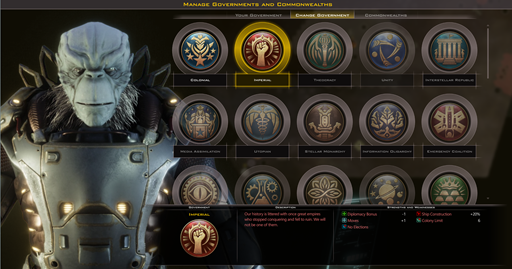 New Citizen chosen: Administrator. Because I will be building more constructors and Hypergates soon. I have 3 citizens (starter, one I got from building Temple of Despair and one I just picked). Early game prognosis: Very good. From here on out, I'll just highlight major events. Kora produces 13, while most of my colonies currently produce 2 to 3. To get them built up, I send them Supply ships. The Korath meet the humans. Filthy Altarians steal a planet. During early game Kora gets its default tiles built up. I move to Aid Economy which I set to repeat until I get some terraforming tech. I use the Nano Fabricator to build up my planets. I construct a Hypergate connection between my home solar system and the "super solar system" to help get supply ships over to it more quickly. 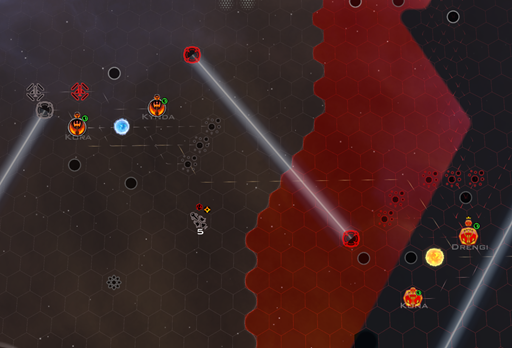 Hyperlane between Kora and Ruin. Battles now show damage on screen. Spore weapons are a double-edged sword. On the one hand, you get the planet... but on the other hand, the population is gone, which leaves no people to work in the factories or slave pits. It also means any citizens that were on that planet aren't captured. They're dead. 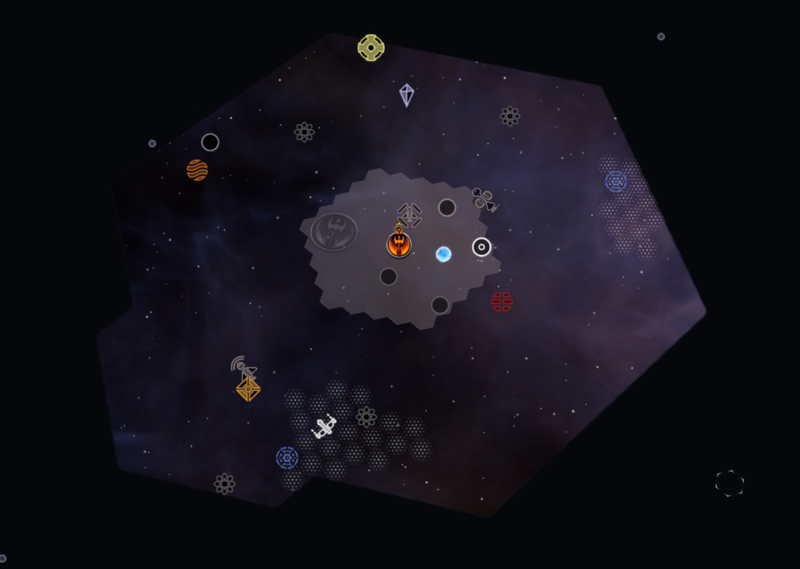 In my game, my home world got captured and I used a spore ship on it. 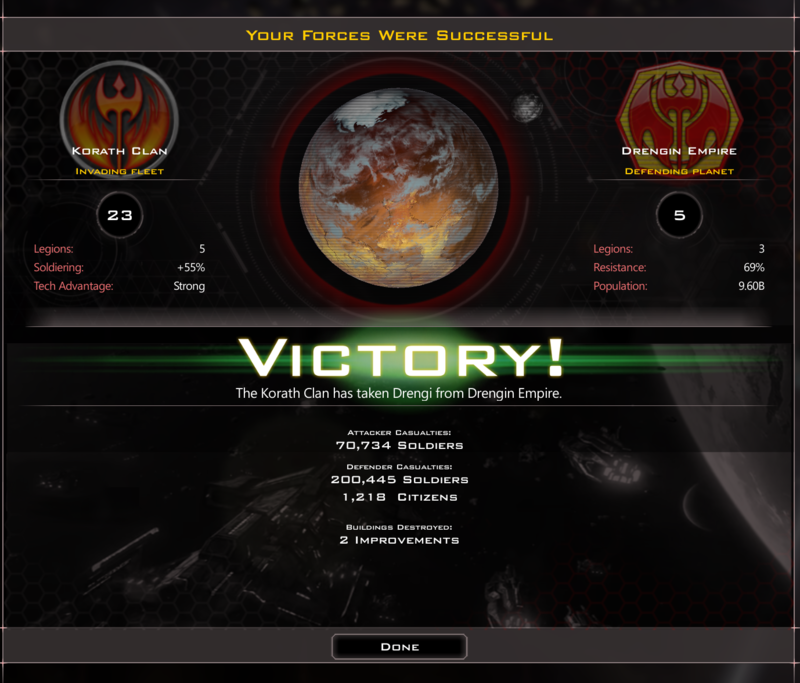 I got the planet back, but my empire was never the same. Rebuilding Kora was a major focus here from my mistake in exterminating the population. 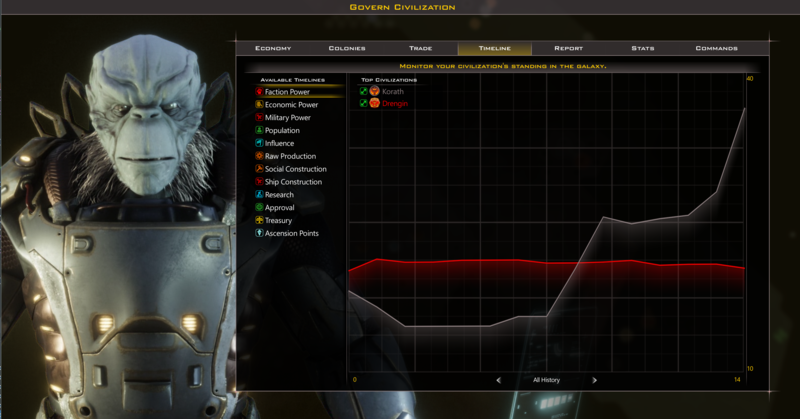 The Drengin occupation forces wiped out a lot of what was there, and their initial invasion destroyed my artifact. Normally, I would say it was a total loss, but I need revenge on the Drengin for what they did. I also need to research atmospheric cleansing since Kora is now a toxic world. The Drengin must be our slaves. 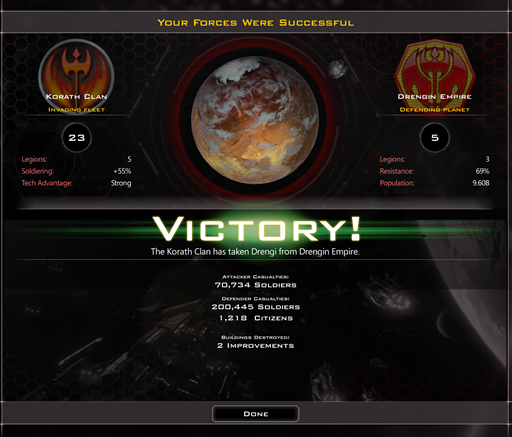 So the invasion force does not include sport ships. At least not for the capital world. 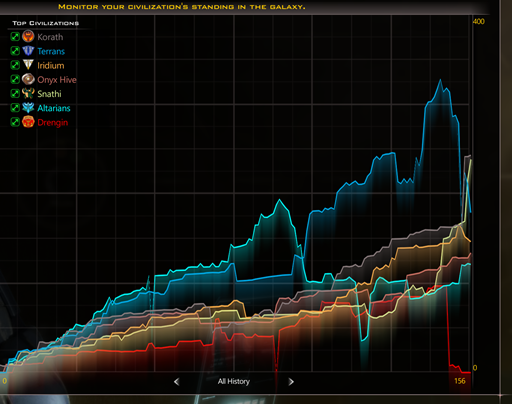 If you want lots of trade, always make sure the Iridium Corporation is a player. That's all money they're trading with me, which is very nice. It has let me keep my taxes way down. There are some interesting AI Mysteries here. The Iridium Corporation ship construction is actually better than mine most of the time, but they have basically no military. They're rich, but weak. They're at war with the Snathi, but they're a pretty minor power. The humans are obviously doing pretty well. They're the only ones who really can contest my power. The question is: why? And that's where the magic of AI programming comes in. Figuring out the "why". 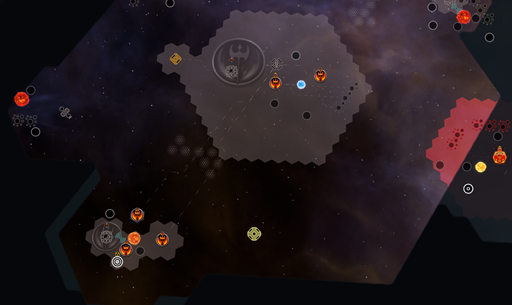 You can see that they have the ability to build bigger fleets. Look at the Drengin's capability versus their actual military. Why were they not able to keep up? Kora has built the Technological capital, which unlocks the Aid Research project for just that world. However, it is 100 research for 200 cost, which is a much better deal than the old aid research. 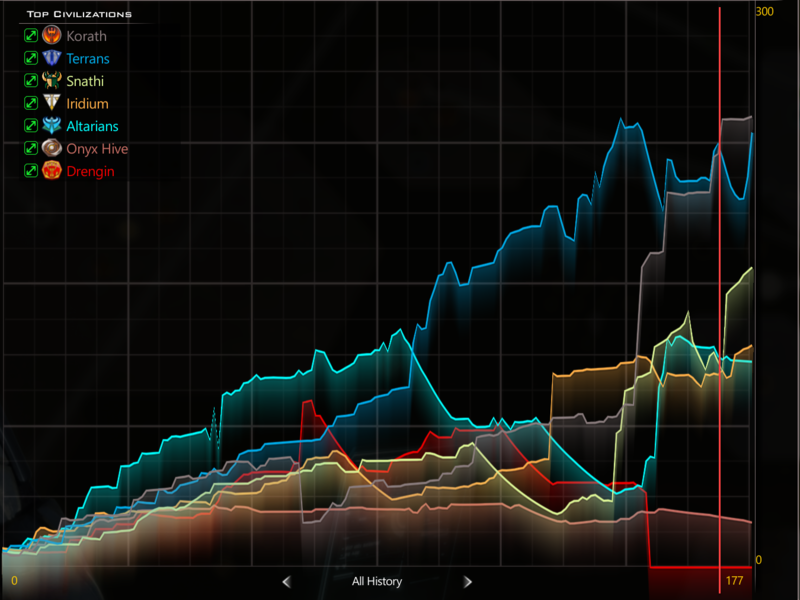 Some people will grumble that you can't do it on all worlds now, but it really messed up the pacing. 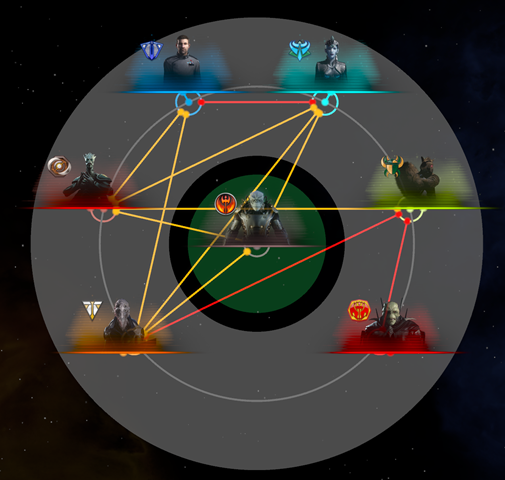 To balance this, the cost of tech progression has been reduced. The dark gray area in the top left is my territory. The humans are blue. The Snathi are yellow (top). The bottom right I don't have in range yet, so I don't know everything that's there. The Iridium Corporation is orange. More investigation makes me think the AI is being too greedy on taxes. This causes unhappy people, which reduces productivity. So yes, they have lots of money, but they are losing too much production. The red vertical line shows when I modified the AI's tax rate. This is eadch player's research. The Korath of course are doing fine already since I built the tech capital. 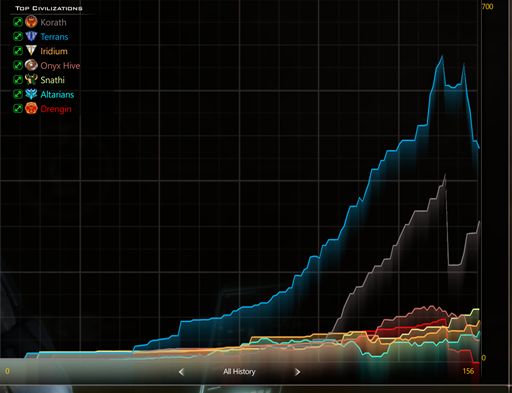 But as you can see, the others benefited by trading income for productivity. This is each civilization's approval level. You an see where each one starts to jump up. 100% approval is a waste for your entire civilization. But if it's less than say 80% and you have plenty of money, consider lowering taxes. They are very powerful, but you will, ultimately, end up playing them as a malevolent civilization if you want to get the most out of them. 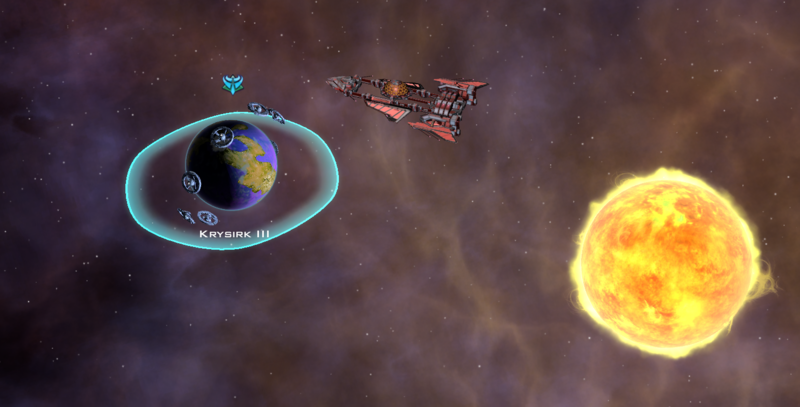 When using the spore weapons, use them only on planets with low populations already (minor worlds). Use legions on on important worlds. The Korath felt a little OP in GC2, are they better balanced this time? One example of what I'm talking about, sure, Slave Canyons cost them -3% influence each, but when they can just build a Dark Influence building for +200%, this feels less counter-balanced, and more overcompensated. 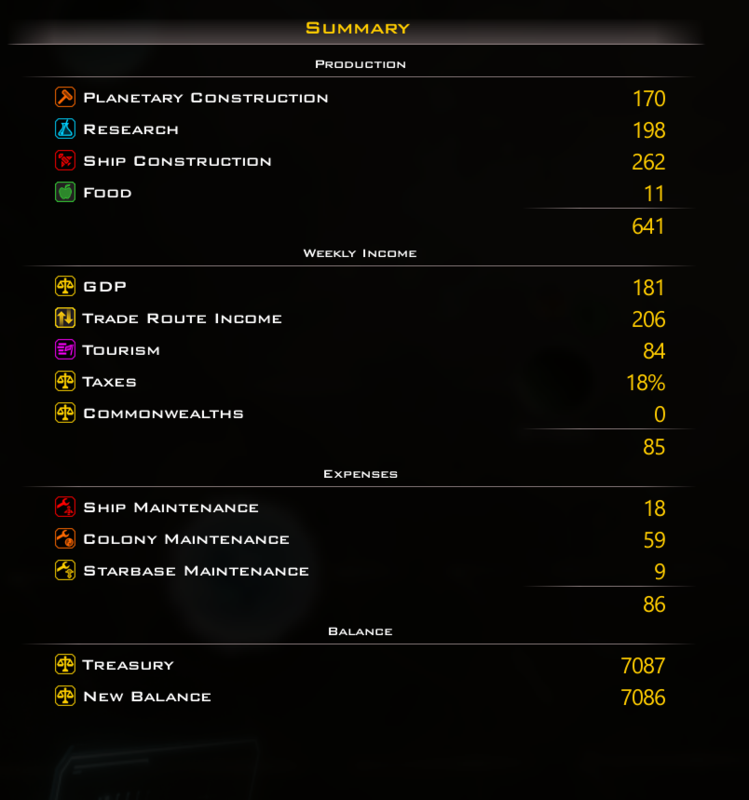 Having a no maintenance economy building that topped what the Iconians had is another example. Should Tourism not be renamed 'Migration' so that it makes more sense for xenophobic races? 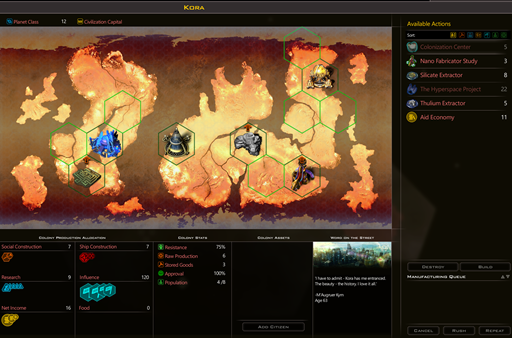 Is the Temple of Despair player unique or planet unique? 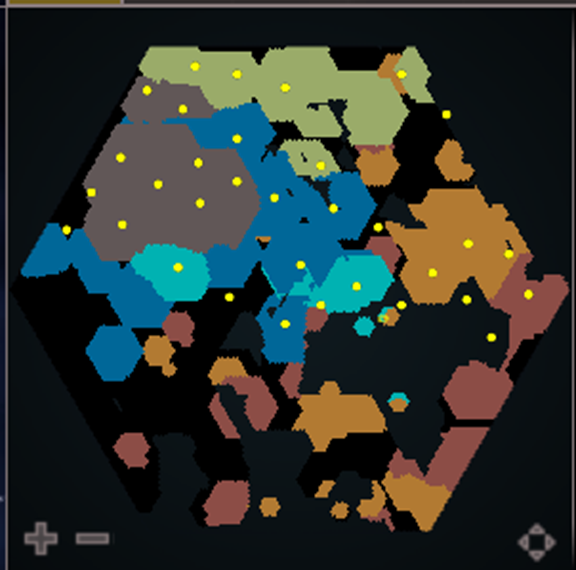 I was thinking of the map size, the sensor is nice on a small map, but less important if you play huge. 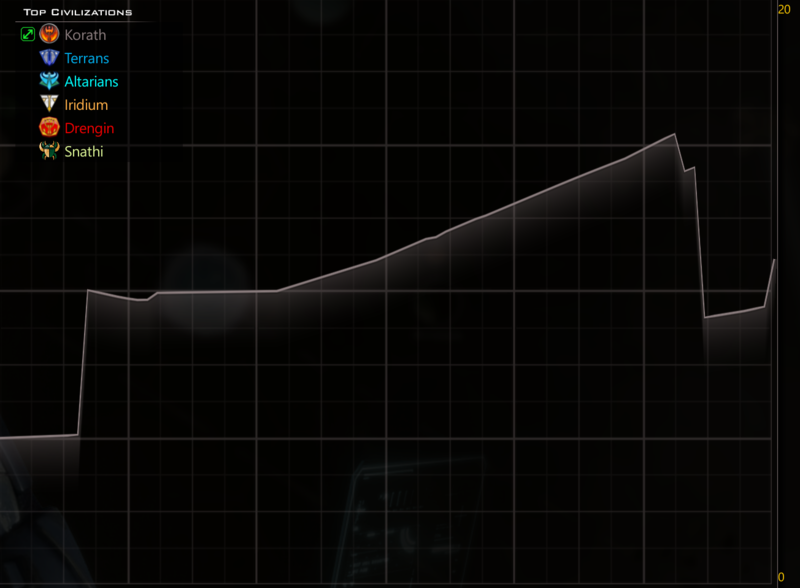 Totally different system in GalCiv III. No Slave Canyons for instance. For Retribution, I kind of crossed Terran and Drengin styles for a bit of a hybrid. It made them a little more sophisticated than the Drengin but still pretty evil to play. It's player unique. The sensor thing isn't the main benefit, but it does help players start out. Its bigger importance is getting that Commander early. Nothing wrong with that, just making sure they're more balanced. 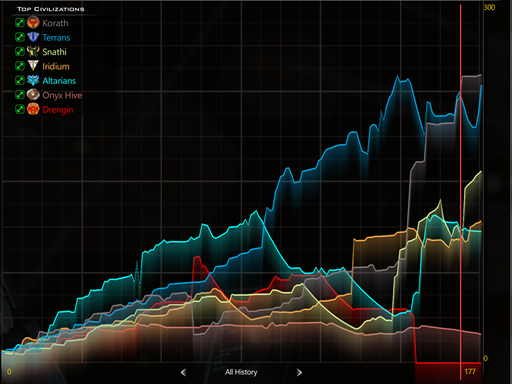 Perfect balance isn't really possible most of the time, just, you know, nothing insanely OP or anything. Indeed, a bit like doing tourism in Taliban country? So my point it would make more sense to name that migration, as it is more plausible that any civilization (except perhaps a kind of 'AI unity' one?) has a fair amount of internal migratory flux that can be commensurate with the size of their empire. Tourism? Not all of them would allow leisure trips, even from their own citizens (not long ago Chinese could testify that they were not allowed to travel in their own country freely). As of now, even on earth many autocracies have strict controls on who can enter their territory and you need anyway a strong justification about that. So interstellar tourism? Dubious. It is a game. You know fiction, fun, make believe. Space Monkey's that enslave or eat every one they meet (Drengin)? Dubious. Given that there are a wide range of moralities on our own planet with our own species, it's dubious to claim anything about a species orbiting another star, having different evolution, different biology, a different environment on their planet, etc. We have zero measure of how these and about a million other things effect our morals, and even with that, there is a range. To claim that another species would not act in ways that to us, make no sense, is reaching. The real problem is the idea that other species wouldn't be poisonous and malnutricious to them, or that our microbes wouldn't tear them apart from the inside. Metacritic are such a tease. They said this would be released 20 minutes ago. Because I'm in New Zealand and it's 21 February. 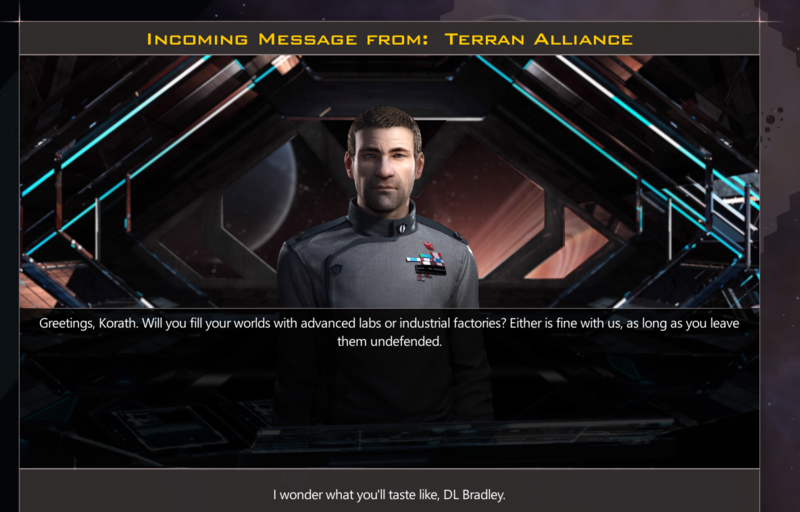 But I merrily log on to Galactic Civilizations III on my desktop and, ah, no, it's still Intrigue.